Woah ... your geometric design could be making me wonder my own sanity (especially because viewing during school holidays). Can see a cat's eye looking right back at me! Neat, fantastic piece of graphic design!!! I enjoyed your illustration today and also wanted to tell you that I found the Wain link very interesting. My mother had some very old postcards whose graphics were similar to Wain's cats on the beach. I am now curious as to who the artist might have been. Really cool concept Ian! Even though it is very geometric, it still has an organic feel to it with all the curves. Very hypnotic! Well done! This is soooo coool!! I also recall seeing the work of the mentally ill cat artist some time ago--thanks for posting that person's amazing and intriguing work as well!! This is captivating, Ian! What a cool idea with a really excellent result! 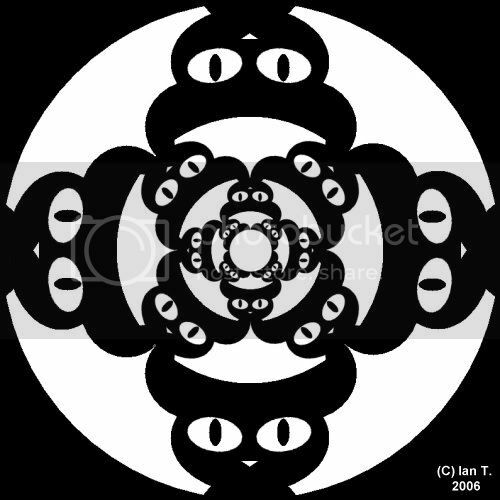 It has such a feeling of depth and motion - it's like looking into a cat-vortex:> I like the black and white, too...works so well in a purelu graphic sense. Nice one Ian. I like how you just have to unfocus a little and see only a pattern. Yes....I think they really see like this....so cool! My what big eyes your have. This explains why my cat tips his head when he looks at me...he sees me six times. Thanks soo much! Thanks Ian T! I like your cats! great idea. cool design and it is also a good idea for having it as the only painting on the wall with a surprise coaster design for black and white dinner motif. classy. THis is very neat!! GREAT design!! I like this Ian, I am so glad I stopped by. It is not only a wonderful design, but I am sure it would make a great T-shirt, postcard, tattoo.... poster... and much more!